I get asked this ALL the time, so forgive me if you're reading something you already know. As the name suggests, blusher is a product that is trying to emulate the effect of a natural blush that happens to your face after exercise or embarrassment. Pick the more reliable one. In the same vein here, the bronzer would try to recreate the effect of being sunkissed (don't confuse being sunkissed with being gently roasted and red). Sounds simple, yeah? I guess most people are good with this until it comes to application. Let's start with bronzer then. A bronzer is applied with a fairly big and fat brush to the areas where the sun would naturally hit your face. 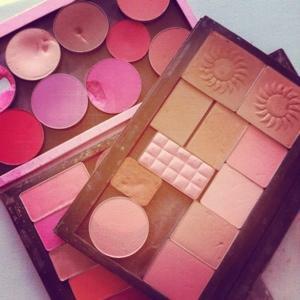 So pick a colour that suits your skin tone and apply lightly across the cheeks, on nose, forehead and chin. Please note the keyword "lightly". Normally you'd find that after bronzer you would need some colour (happens also when you don't use a bronzer) so this where the blusher is useful. You apply it to the fattest part of the cheek when you smile - as long as the fattest part of the cheek is not next to your nose. Aim for blusher to start just below where your cheekbones are and not go further down your face than the tip of your nose. You should looks mildly flushed and, usually, better. To make matters even more confusing, shading and contouring is also back in fashion big time and for that we tend to use bronzers or the "specialist" contouring products, but not the blusher. I tend to use this with my clients on a regular basis because I find it gives the face that nice 3D effect. I'd give a contouring a miss if you don't know what you're doing. There you go, hope the bronzer/blusher confusion is slightly clearer.